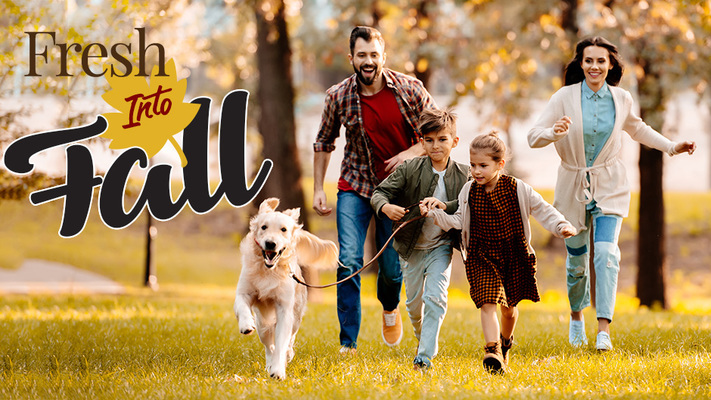 Fall means changing leaves, brisk temperatures and a new wave of things to keep in mind for our four-legged friends’ safety. But don’t fret, fall can be enjoyed by everyone by keeping these tips in mind. The shorter days of fall mean less natural light during daily walks or playing outdoors. Make sure your pet wears a reflective collar or blinking light when outdoors to be more visible to vehicles. Also, as the cooler weather settles in, if your pet is the outdoorsy type, she may have to come inside earlier as temperatures drop since the sun sets earlier. Make sure she has a warm blanket or thick bed to sleep in at night. Also, though we may enjoy snuggling up around a bonfire in the fall, or perhaps an indoor electric heater, keep your pet’s safety in mind. Close off fireplaces or pits and keep your pets away from the spark zone when around a bonfire. Indoors, turn off any heating devices every time you leave the home — and possibly even the room if you have a curious or rambunctious pet — to reduce potential accidents or house fires. As we begin to clean up our yards this fall, keep your pet’s safety in mind. Store all lawn and garden products in a secure place your pet can’t get into. And if applying one last round of lawn product, keep your pet in a safe area until any potentially toxic product has dried. Also, bare plants pose a poking hazard to our pets as they play outdoors; create a small barrier around the plants to help prevent pokes or cuts. Though the weather cools down quickly in the fall, ticks and fleas are still a major issue. These tiny pests are a hardy bunch, capable of surviving the first frost. In addition to continuing to follow a flea and tick prevention routine, eliminate their favorite environments in the yard: the leaf and garden litter piles. Speaking of lawns, mushrooms sprout up on lawns, under trees, in fields and on logs during the fall. While most mushrooms won’t make your pet sick if ingested, several varieties are highly toxic, so it is best to avoid them altogether. Another area to keep in mind as we move into fall is the changing nutritional needs of our furry friends. Cooler temperatures require more energy from our pets to stay warm, meaning they may need to have daily feedings adjusted. Contact us for information on making healthy changes to diets. And while she might not agree with diet changes, this doesn’t mean she should turn to your kids’ school supplies for a snack. While common school supplies such as glue sticks, pencils and markers are generally considered low toxicity, they can cause gastrointestinal issues and blockages if ingested. The only paws that should be able to grasp school supplies should have opposable thumbs.